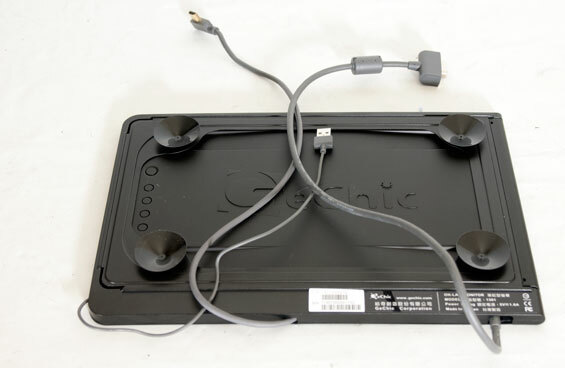 Recently Taiwanese vendor GeChic got in touch with us about a new product set to appear on American shores, the On-Lap 1301 laptop monitor. The concept? A portable 13" screen that affixes to the back of your notebook lid and swings out, extending your desktop space and powered by a USB 2.0 cable. The first inclination is to expect another DisplayLink peripheral, but the On-Lap 1301 actually uses HDMI or VGA out from your notebook, and thus dodges all of the pitfalls of using a USB-driven screen. So how effective is the On-Lap 1301? We took it for a test drive to find out if GeChic's screen is the productivity enhancer you were looking for. GeChic is presently an exceedingly small company with just one product to their name, and that’s the one we have on hand. 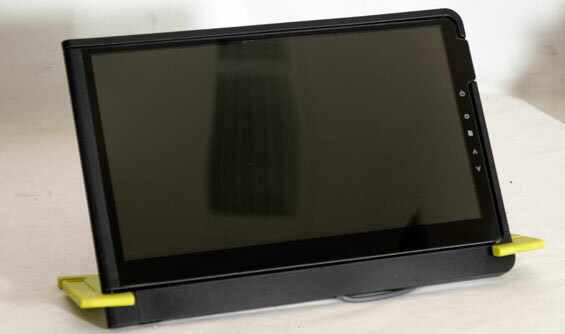 The On-Lap 1301 is a 13” screen that can use either suction cups to affix to the back of your notebook lid and hinge outward, or stand up using included rubber green stands. The On-Lap is basically as fresh as it gets; the instruction manual’s English is understandable, though a bit tenuous at times and occasionally light on detail. Still, it’s easy enough to divine how to use the screen. You can opt to use the included rubber green stands, but you’ll find them problematic for a variety of reasons we’ll get into in a bit. First, there’s connecting the On-Lap. The only cables included in the box are the VGA and HDMI dongles; the USB power cable is tucked into a small area beneath the screen. There’s a panel that slides off, and from there you extend the cable out of the side. To the left are the two internal connectors for the screen, but this is where the On-Lap runs into its first major problem: both cables are routed out of the bottom of the screen, essentially making the stands next to impossible to use as the screen itself will always be propped up on the display cable itself. That’s probably fine, though; the stands themselves are flimsy and don’t have any direct way to actually connect to the screen, making them impractical in real world use. They strike me as an afterthought; the On-Lap is clearly designed to be affixed to the back of your notebook lid. On that front things look much better. Four suction cups get screwed into the back of the mount, and the suction cups themselves are actually extremely effective. GeChic includes mylar pads which you can affix to your notebook lid (and then affix the suction cups to the pads), but I found them inessential: the flat surface of my ThinkPad’s lid was perfectly fine and suction was more than adequate. This is really the ideal way to use the On-Lap, with the screen hinging out to the right. It looks more than a little awkward on my 11.6” ThinkPad, but just about any 13” ultrabook or portable should be just fine. As for weight, while the On-Lap is about two pounds, I found that most notebooks should still be able to handle the weight without tipping. Since you can adjust how far out the screen swings and the screen itself is the heavy part, it’s not difficult at all to balance the two together. I'll cop to it, I was kind of feeling the review out and should've been more direct. Maybe best to leave quantity meaning quantity and quality meaning quality? For the feature products, you guys should continue the always great reviews. Even if it means having to delay it for a while. I might try and read the poorly reviewed competition first, but I'll ALWAYS read the Anandtech version when it come out. For small things like this, keep cranking out these shorter reviews. Something is always better than nothing, and now I'm potentinally interested in a product that I didn't now existed. Same, but it wont with W8 as it's the minimum resolution.